1- My favorite Label nesties! 3- "Jacques" on Finding Nemo is my favorite character! The card is on Whisper White (another favorite, stampin' up cardstock is SO much better than anything!) with retired Ginger Blossom paper on the front. I did actually stamp "Jacques" (from Fishy Friends, retired) on the inside of the card and cut out a little window with the nestabilities. I colored him with the pastels because I don't have the markers yet... 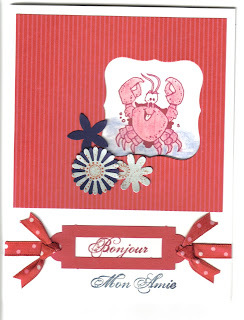 I used Bonjour and Mon Amie stamps from the Carte Postale set. The flowers were punched with the Spring Blossom punch (another favorite that is sadly retired) in Night of Navy and random dsp. That ribbon is NOT my favorite. I bought at the $1 spot at Target. Blech. (Not on Target...it's my favorite).